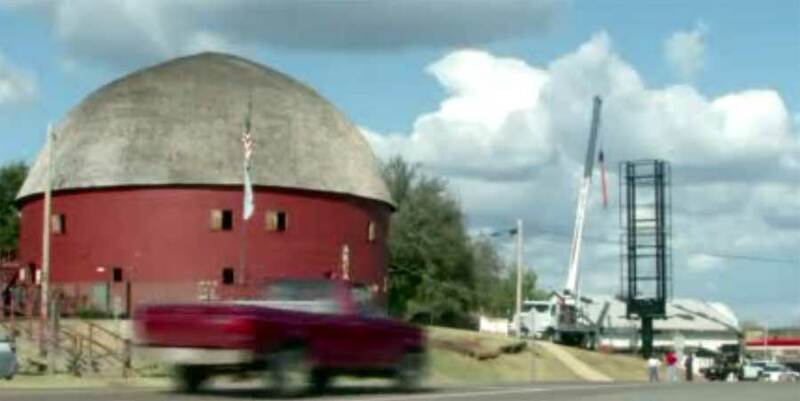 A giant steel billboard is being erected just a few feet from one of Oklahoma's most notable landmarks- the Round Barn in Arcadia. Visitors traveling Route 66 call it an eyesore. 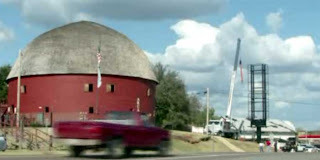 If approaching from the east, the sign almost completely obscures the view of the barn from the historic highway. But fans of the Mother Road and the unusual barn aren't keeping quiet. They're voicing their complaints and, for now, may be winning. Construction has been temporarily halted. But there is no guarantee the sign's owner, Zoom Media LLC, won't eventually proceed. Members of the Arcadia Historical Society promise a court battle if the construction continues. Well, I would like to say it's surprising but these days when you have people doing crap like taking money to tattoo company names on their forehead, well, it's not really that surprising.